Your business has tiers of applications and data. The protection needs of those applications and data fall across a spectrum—starting with basic low cost daily backup, and ranging up to zero data loss with zero downtime. Along the spectrum, compliance requirements must also be met. Dell EMC believes customers are best served with a family of products that deliver precisely the right level of protection for each business need. Dell EMC further believes that customers need a way to deploy and scale data protection in a manner that reduces overhead, time, cost, and risk. 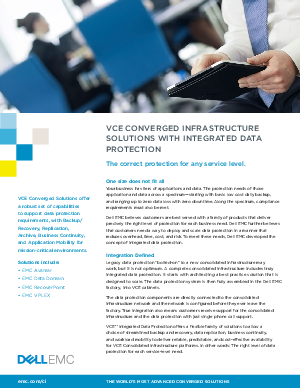 To meet these needs, Dell EMC developed the concept of integrated data protection.